I was genuinely excited to check out “Elephants in the Room” by Charlene Wexler, for the most part, because collections of short stories in book form are rare these days, and I always wonder why so few people try to write them. “Elephants in the Room” is a collection of well over 40 short stories. The stories appear to be chronologically ordered, and cover topics and events from the different stages of life. It seems they are based primarily on the author’s life, though it is sometimes hard to be sure. Wexler’s experience and ability as a writer is clear throughout each story. The writing is superb and the book is well organized. It is clear the author put some serious effort into the writing and the actual book itself. The cover has its own well-done artwork and the production value of the book alone is obvious. All of this makes the review of the actual subject matter even harder, because even though Wexler abilities are clear, the content is somewhat lacking, at least for anyone who is not yet a senior citizen. I don't mean that some younger folks won’t find something of value in the book, but overall there is very little that would be relevant. The stories are mostly just stories. Something about the book felt constantly familiar, but it took me quite a while to figure it out. The writing style and stories themselves reminded me of the stories I would find in Reader’s Digest as a kid. This was a nice nostalgic feeling, but ultimately I would expect to find stories like this on a blog and not in a book. Other than the Reader’s Digest explanation, the best way I can sum up this collection is that this is a book best suited for family and friends of the author as a fictional collection of shared history. In that context, the book ultimately succeeds, mostly because Wexler really is an excellent writer. Beyond that “Elephants in the Room” may find a scattering audience among die-hard short story fans, a few grandparents, and those who enjoy the wholesome story telling style of Reader’s Digest. 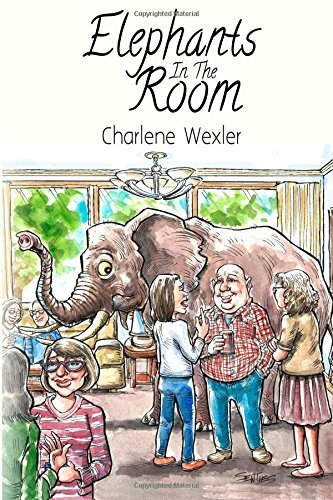 Overall, I give “Elephants in the Room” by Charlene Wexler 3 out five stars, since the writing and book quality are exceptionally well done and it clearly is a labor of love.